The deep and universal desire for connectedness is explored here in stunningly original ways that speak to us all. 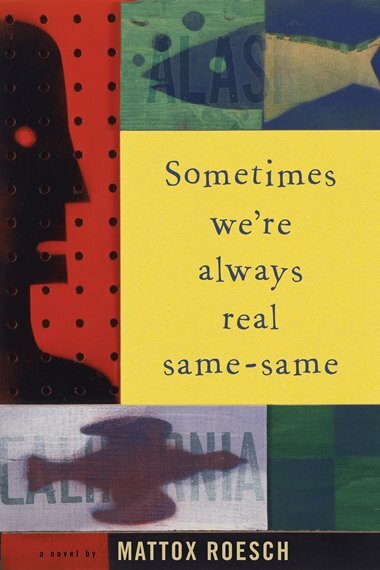 Sometimes We’re Always Real Same-Same is an exciting debut by one of America’s finest young writers. Roesch’s offbeat debut is set in Unalakleet, Alaska, population 700, a destination that seems like the end of the world for teenage L.A. gang member Cesar Stone, uprooted by his mother after his older brother catches a murder conviction and a life sentence….Roesch’s compelling story, exotic setting and eccentric characters make this coming-of-age tale a fresh, welcome read. He’s in the middle of nowhere, Alaska, because his Eskimo mother has moved home, and Cesar, a seventeen-year-old former gang banger, is convinced that he’s just biding his time ‘til he can get back to LA. His charmingly offbeat cousin, Go-boy, is equally convinced that Cesar will stay. And so they set a wager. If Cesar is still in Unalakleet in a year, he has to get a copy of Go-boy’s Eskimo Jesus tattoo. Go-boy, who recently dropped out of college, believes wholeheartedly that he is part of a Good World conspiracy. At first Cesar considers Go-boy half crazy, but over time in this village, with his father absent and his brother in jail for murder, Cesar begins to see the beauty and hope Go-boy represents. The choice. “To your Eskimo name,” Go says. “But I don’t want an Eskimo name.” I wonder if Eskimo names are the kind of thing that Go can just hand out without talking to anyone. It seems like something parents should decide, like something Mom should come up with. A name is such a permanent thing. A name makes the person almost as much as the person makes the name. And as we sit in Go’s car on the bridge, I think about how even though I don’t like the name Cesar, it was given to me by Pop, and so I accept it and can’t fathom changing it. A work truck rolls onto the bridge, maybe heading out of town to the new jail. The guy looks like an engineer from Anchorage. He pulls alongside us, slow, trying to pass, then stops. There are just a few inches between our vehicles. The guy folds in his side mirror. He rolls down his window, and Go, seeing this, rolls down his. Mattox Roesch lived in Minneapolis for ten years where he played drums in an indie rock band, designed and peddled skateboards, and founded a T-shirt printing business. His award-winning fiction has appeared in numerous magazines, including The Missouri Review. He and his wife now live in Unalakleet, Alaska. Author Photo by Tera Cunningham.